This property is directly associated with the early twentieth century era (1920-1930) when a significant number of commercial buildings were constructed and the modern downtown commercial district was fully established. In 1923 Seattle adopted its first ordinance that regulated specific geographic areas for specified uses; it allowed the most densely concentrated commercial development to occur in the downtown core. The economic prosperity of the 1920s stimulated the development of numerous major highrise commercial buildings, as well as smaller-scale bank and commercial buildings, major hotels and apartment hotels, club buildings and entertainment facilities, which were typically designed by leading Seattle architects. During this era, the original residential district was entirely absorbed by commercial and other real estate development. By 1930, virtually all of the old residential properties - as well as many of the immediate post-fire era commercial buildings outside of Pioneer Square - had been demolished or removed. From the 1920s until the 1960s, the nearby Belltown neighborhood was the center of the film distribution industry in the Pacific Northwest. Seattle was a major center for film related activity with more that fifty movie theaters in operation in city during the 1920s to 1940s, and more than 400 theaters around the state. All of the major studios, as well as many smaller studios, used distribution centers – known as film exchanges – that were located in Belltown. Films were shipped to Seattle by rail from Los Angeles and then transported by truck, ship, rail or automobile to local theaters in Washington, Alaska, Idaho and Montana. Each distributor had salesmen who would preview the films and then go on the road to distribute e the new releases to theater owners and operators. Many theater operators came to Seattle to personally view the films and select titles that they would feature. 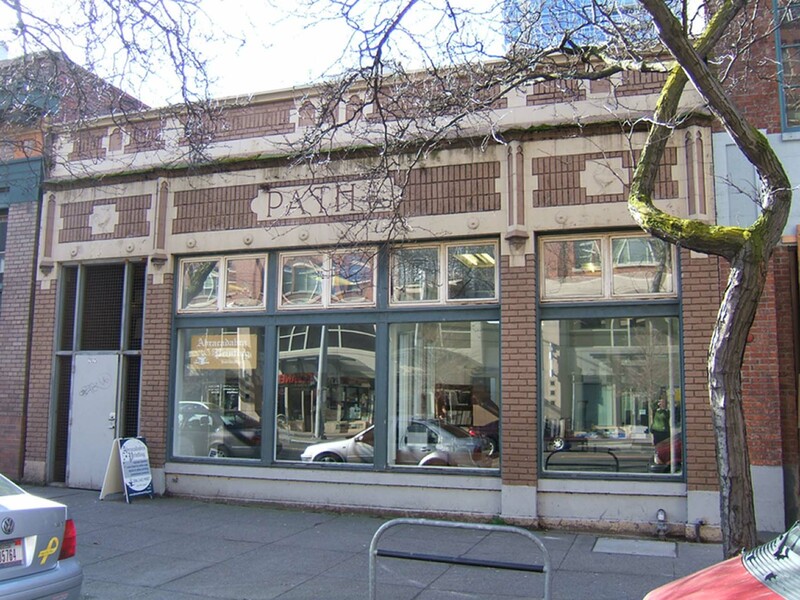 While “Film Row” was concentrated near Second Avenue and Battery Street by the mid-1920s, the subject building, which was built in 1922 is Seattle’s earliest extant film exchange building. In 1927, the Film Exchange Building (destroyed, c.1990) was constructed at Second Avenue on the entire half-block between Battery and Wall Streets and housed representatives from MGM, United Artists, Universal, Columbia, RKO, Paramount and Warner Brothers. Another major film exchange building was built in 1928 at First Avenue and Battery Street, now the location of the Belltown Court Condominiums. The McGraw-Kittenger-Case Building (c. 1930) at SW corner of Second and Battery subsequently housed the MGM distribution activities. Other buildings in the immediate vicinity housed theater furnishing suppliers, poster companies, and other film or theater-related businesses. Pathe or Pathé Frères is the name of various businesses founded and originally operated by the Pathé brothers of France. Their movie company was founded in 1896 and by the early 1900s it had become the largest film equipment and movie production company in the world, as well as a major phonograph record producer. By 1909, the company had film production facilities and film distribution system in France, Belgium and London; and had built more than 200 movie theaters, including theaters in New York City Rome and Moscow. Prior to WWI, Pathe dominated the European market in motion picture cameras and projectors. In 1908, the company invented the concept of the newsreel that was shown in theaters prior to the feature film. Newsreels featured the Pathé symbol of a crowing rooster at the beginning of each reel. Beginning in 1914, the company operated film production studios in New Jersey and several extremely successful movies were made there. By 1918, both the record company and the film division were so successful it became necessary to separate the operations; thus, Pathé -Cinema became responsible for film production, distribution and exhibition. In 1923, Pathé sold its U.S. motion picture production arm, which Joseph P. Kennedy merged with two other companies to create RKO Pictures in 1928. In 1927, Pathe sold its British film studios but retained its theaters and film distribution operations. Between 1929 and 1990, the company went through several changes in ownership, business operations and name. Since 1999, it again became know as Pathé and continues to produce and distribute motion pictures and DVDs. A design for a Pathe Film Exchange Building was prepared in 1918 by Gerald C. Field; however, it is not if or where it may have been constructed. The building permit for the subject building was issued to Mary Richardson and Minnie Crawford on May 9, 1922 with construction plans prepared by J.G. Everett. Film exchange buildings included special vaults to store highly flammable nitrate films and often included small theaters in order to screen films. The Pathe Building included office, clerical, inspection and shipping spaces as well as two fireproof and well-ventilated storage vaults, a viewing booth, a rotation room and a large poster storage space. A name plate“Pathe” is inscribed in cast stone on the façade. Of particular note is the inclusion of two Rooster ornaments that flank the name plate; the Rooster is the long-time symbol of the Pathe Company and continues to be used as of this date. Mary E.D. Richardson appears to have continued to own the building until 1962. In 1989, the building interior was altered in order to be used by the YWCA as a community center. The current interior condition is not known. This appears to be a relatively well- preserved example of a unique downtown property type directly associated with the motion picture industry. As a rare and architecturally interesting former film exchange facility this property is worthy of addition examination and research. Located mid-block on the west side of Third Avenue between Virginia and Lenora Streets, this one-story building was originally designed and constructed for a specific commercial use as a motion picture film exchange facility. It appears to have subsequently been used for other commercial purposes. It measures 35’ x 108’ and exhibits a one-part commercial block façade composition with interesting cast stone (or possibly terra cotta) ornamentation. The ordinary masonry structure with concrete basement and foundation is clad with brick that has been painted a red brick color and includes ornament that has been painted a cream-beige color. The façade is distinguished by a decorated brick parapet that includes modest applied and inset Collegiate Gothic derived details. The façade is divided into three bays; a wide central bay flanked by narrower bays. The southern bay is the entry vestibule and the remaining bays hold display and transom window assemblages. At the center of decorative brick façade is a cast stone (or terra cotta) panel inscribed “PATHE” indicative of the original ownership and use of the building. In each of the side bays is a cast panel with a rooster emblem also representative of the original company that used the building. The original transom windows appear to have had a five panel vertical window configuration and have been replaced by two panel members. The display windows with concrete bulkhead retain the original fixed plate glass configuration. The entry vestibule has been modernized and altered. There do not appear to be any intact or architecturally significant interior building features, finishes or public spaces.